It’s not really that mysterious. Anyone looking to buy or sell their house wants to know that they’re going to work with a real estate agent they can trust. They want to know that the agent they choose has their best interest in mind, will negotiate the best price possible, understands their market, and has a healthy track-record of buying and selling homes. Without that – without trust – the prospect will never work with you. And since 70% of buyers and 75% of sellers find their real estate agent by searching the web, it makes perfect sense that your real estate agent bio is a vital part of growing your business and converting website leads into clients. Your bio is the place that website visitors go to decide if they’re going to work with you. Seem like a tall order? But crafting a real estate agent bio that builds trust, credibility, and resonates with your target market isn’t as difficult as it seems. Really, it’s just six steps. Here are those steps – each with pertinent examples to illustrate my point. But one of the worst things you can do with your real estate agent bio is to find an online template and plug in the blanks. The problem is that every market is different. Your market is different than the market that that free template you found online was created for. You need to create a bio (pic and copy) that resonates with your market, not with someone else’s. And who knows your market better than, well, you? 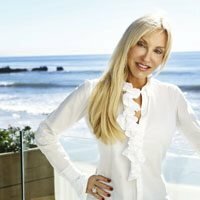 “For nearly 30 years, Irene Dazzan-Palmer has been hailed as ‘the queen of coastal real estate.’ A consistent top producer in Coldwell Banker’s Malibu Colony office and an Estates Director for Coldwell Banker Previews Internationa, she has amassed nearly $2 billion in career sales and a history of selling some of the nation’s most significant coastal homes alongside her partner and son, Sandro Dazzan. Irene has a niché and she knows what it is. She isn’t afraid to exclude people uninterested in her niché. By doing so, she speaks directly to her market and resonates with the people that are interested in high-ticket coastal homes. Find your niché and represent it with confidence in your real estate bio. Here is another example of an agent who understands her market: Leslie Woods. “Representing Mid-Peninsula homeowners and future homeowners, Leslie is committed to listening to her clients’ needs and utilizing her keen negotiating skills to ensure a successful transaction. Raised on the Peninsula, Leslie understands the numerous intangible benefits of life in the Silicon Valley, with its unmatched weather, culture, and diversity. Leslie graduated from Cal Poly San Luis Obispo with a Bachelor of Science degree in Food Science and Nutrition, and subsequently returned to the Bay Area to excel in pharmaceutical sales with Wyeth Laboratories for over ten years. She joined the Real Estate profession as her three children approached their middle school and high school years. In the past eight years, Leslie has become an esteemed realtor, highly regarded by her clients and professionals in the field. 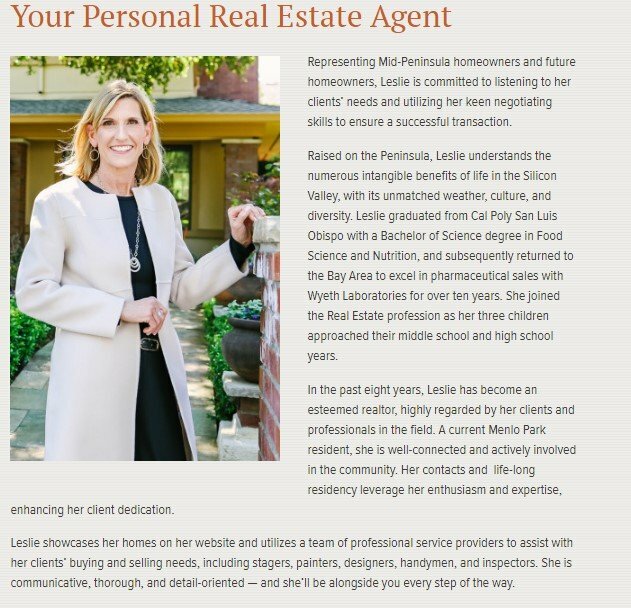 A current Menlo Park resident, she is well-connected and actively involved in the community. Her contacts and life-long residency leverage her enthusiasm and expertise, enhancing her client dedication. Speaking to the middle- to high-class homebuyers, Leslie puts herself in the marketing pit of “representing Mid-Peninsula”. Not a bad move since that is the exact market she operates in. 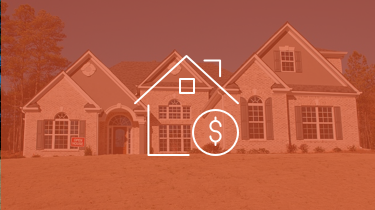 Do you serve first-time homebuyers or people who’ve bought several homes before? Do you prefer working with buyers or sellers? What price-point do you want to target? What area of your market do you want to focus on selling homes in? Is your market primarily liberal or conservative? How old are the people in your market, generally speaking? Do you serve males or females or both? You don’t necessarily have to answer all of these questions about your market, but the better you understand the people you’re serving, the more that your agent bio will resonate with them. One of the best ways to get your bio converting website visitors (or at least getting them to call you on the phone) is to make sure your bio addresses all the big objections they have swimming around in their head. What are they worried about with buying or selling a home? What concerns do they have about choosing a real estate agent? What might they be worried about when considering working with you? The answer to those questions should be addressed in your bio. Ease their fears and explain why you’re the perfect person to help them through their specific challenges. One objection, for instance, that many buyers and sellers have is in regards to how well you – the real estate agent – know the area. How familiar are you with the market and are you really the best expert for their needs? Another common objection from home buyers and sellers is in regards to how much experience the real estate agent has or doesn’t have. While a lot of the objections from different real estate markets overlap each other, your market’s buyers and sellers might have concerns unique to your area. Whatever the case, make a list of all the big objections your market will have. Use the 80% rule – if 80% of your market has the objection, then diffuse it in your bio. Every home buyer and seller have an image in their head of what they want their agent experience to be like. More than likely, they want it to be a smooth experience, one where the agent negotiates vigorously on their behalf, and one where they walk away with more money in their pocket (or the keys to their dream home without breaking the bank). It’s not enough to understand your market’s fears. You also need to understand your market’s deepest desires. Answer this question: What does your market hope to get out of working with a real estate agent? What are the most important things to them? Once you have the answer to that question, you can make your bio resonate with your market by stroking their desires within the copy. “#1 Top-Selling Agent of La Jolla Homes Overall -and #1 La Jolla Listing Agent* Greg Noonan gives you the best chance to succeed in this complicated market with sub-communities varying widely in value. 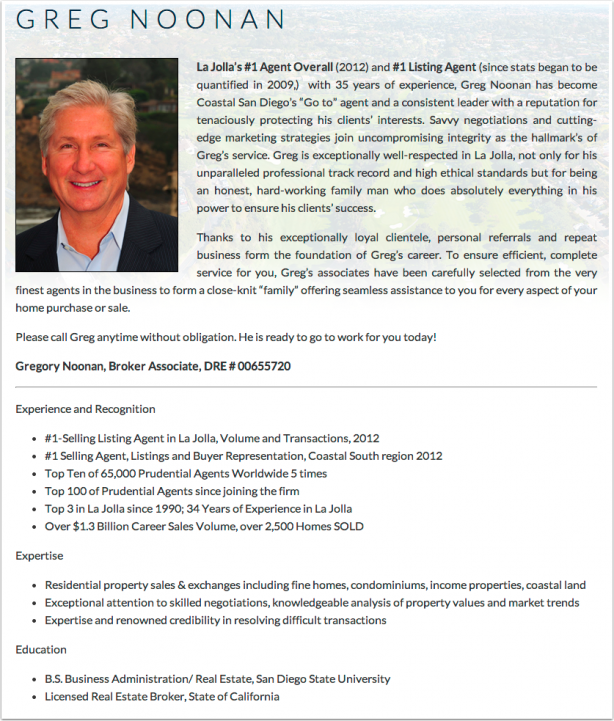 As Coastal San Diego’s “Go To” agent and the consistent leader with a reputation for tenaciously protecting his clients’ interests, Greg is dedicated to serving you with savvy client-focused negotiations and state-of-the-art marketing strategies joining uncompromising integrity as the hallmarks of his service. Greg is exceptionally well-respected in La Jolla, not only for his unparalleled professional track record and high ethical standards but for being an honest, hard-working family man who does absolutely everything in his power to ensure his clients’ success and satisfaction. Thanks to his loyal clientele, personal referrals and repeat business form the foundation of Greg’s career. To ensure efficient, complete service for you including cutting edge technology and genuinely caring performance, Greg’s associates have been carefully selected from the very finest agents in the business to form a close-knit “family” offering seamless assistance to you for every aspect of your home purchase or sale. Write down everything that your market wants out of an experience with the real estate agent they choose. Again, use the 80% rule – if 80% of your market desires it, then mention it in your bio as something you provide. Your bio photo says a lot about who you are and what service you provide. 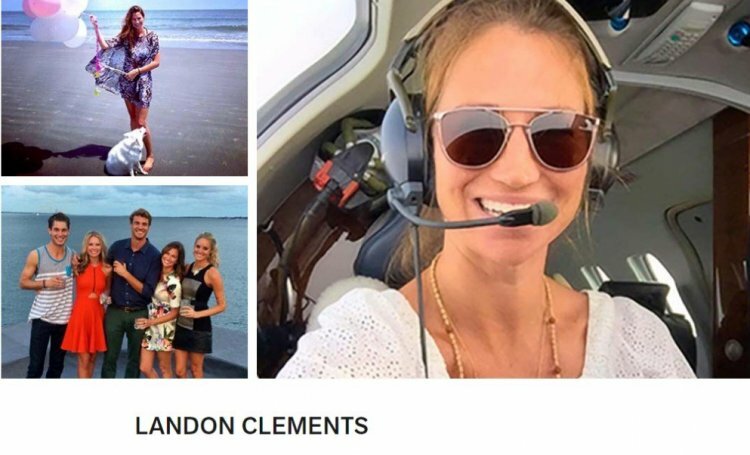 And now look at this bio photos(s) from Landon Clements (yes, she’s a real estate agent and this is from her “About” page, right above her bio). The first picture communicates professionalism, expertise, and seriousness. The second is fun, inspiring, and at least a little dreamy. Here’s the thing, though: both of these are perfectly fine. There’s no cookie cutter way to take a perfect real estate agent photo. It’s all about what your market wants and expects. If you’re serving first-time homebuyers, for instance, then you probably want to use a friendly and approachable bio picture. But if you’re serving multi-millionaires, then a more professional vibe might be better. Once you know you’re market and who you’re serving, then you can take the perfect bio photo for your market. Should it be friendly? Should it be serious? Should it be professional? Should it be flippant? That’s a question only your market can answer. Now that you understand your market – from steps 1-3 – you can write a bio that resonates with that market’s desires and addresses that market’s objections. “Aaron Kirman, President of the International Estates Division of Pacific Union International is one of the leading real estate agents in the USA and has repeatedly been named Top Agent in Los Angeles. With over $4.5 Billion in sales, Kirman represents the finest estates across the globe and was ranked #5 in the U.S by the Wall Street Journal. He has an extensive client base featuring those who seek the luxury lifestyle including heads of industry, celebrities, royalty, major lending institutions and foreign investors. 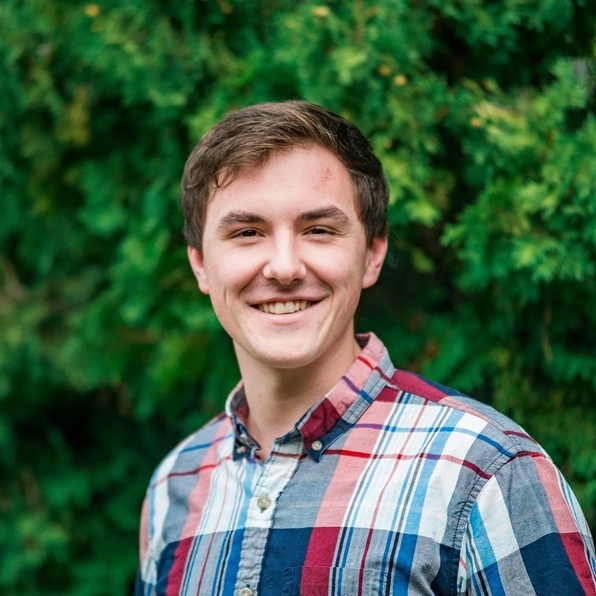 “Robert Perlin brings his experience as a Special Education Teacher to Baird & Warner, Oak Park/River Forest. Prior to joining the Baird and Warner team, he taught students with special needs in the Chicago Public Schools. As an educator, he learned how to be patient, detail oriented, proactive and a strong advocate for all his students. As your Realtor, Robert will be an advocate for you. Whether you are buying, selling or renting,he will work tirelessly to promote your best interests. 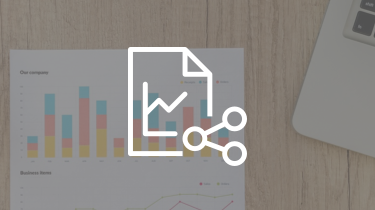 If you are selling, he will work with you to get you the fairest price, in the least amount of time, by using state of the art technology, team collaboration and Baird and Warner’s superior marketing materials. If you are buying, he will work hard to provide you with the best information and market data to inform and assist you so you can be a well equipped buyer with the strongest possible negotiating position. Robert has been an area resident since 1999 and earned his master’s degree in Special Education at Dominican University, in River Forest. He recognizes the unique characteristics and benefits of living and working in Oak Park, Elmwood Park, River Forest and Forest Park as well as the Galewood and Monclaire neighborhoods of Chicago. When not assisting clients, Robert enjoys spending time with his husband Jon and their family, entertaining their friends, traveling and relaxing at their cottage in Sugar Creek, Wisconsin. Wondering if your bio is as good as it could be? Well, the only people who’ll have the answer to that question is your market. So get out there ask some of them (ideally people who you trust will be honest with you) and ask them what they think. Does it resonate with them? What objections might they still have after reading it? What would keep them from calling you after reading it? Was it inspiring enough? Did it speak to their desires and the things that they would want to get out of working with a real estate agent? Don’t spend forever on this step, though. 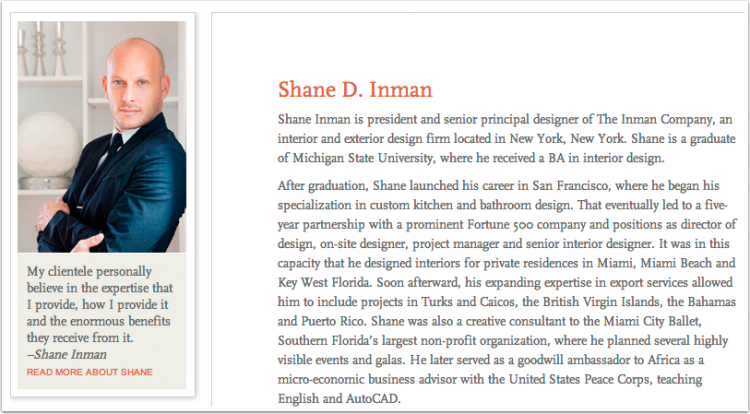 Get your bio as good as you can, set a deadline, and hit the publish button. One thing is for sure: your bio won’t do anyone any good sitting in a Windows Doc somewhere. What your real estate agent bio says, how it says it, and who it’s crafted to speak to is all very important. Which is why it’s so important to get it right the first time. By knowing your market and by speaking directly to them. You can use the above 6 steps to write a real estate agent bio that resonates with your specific market – addresses their specific objections and speaks to their specific desires. Once you do, your ideal market won’t have any choice but to work with you… because you’re the perfect fit. Looking for a website for your Realtor company? 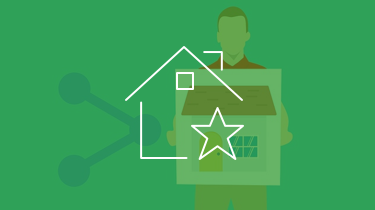 Check out Carrot’s real estate agent websites! 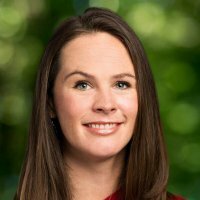 I thought it was interesting how you said that a real estate agent should choose a bio photo that resonates with their market. My wife and I have been wanting to sell our house and buy a new one. It would be great if we could get the help of a professional real estate agent.